"I have always been inspired by the language of turntables and entertainment units from the 1960s," says Singaporean designer Nathan Yong. Which is a remarkable statement when you learn that Yong grew up in a wooden hut by the sea, where he and his brother made their own toys and "waited for low tides so we could pick up treasures from the shore." Growing up with the beach as entertainment, Yong has developed into a resourceful designer, whose work captivated us with its quiet elegance. At Salone del Mobile, the annual furniture fair in Milan, Yong showed his Line Media Console, inspired by "the fluid streamlined forms of 1960s stereo components." We liked the aesthetic so much that we asked Yong to expand the collection. He responded with one of the best-looking bars we've ever seen. 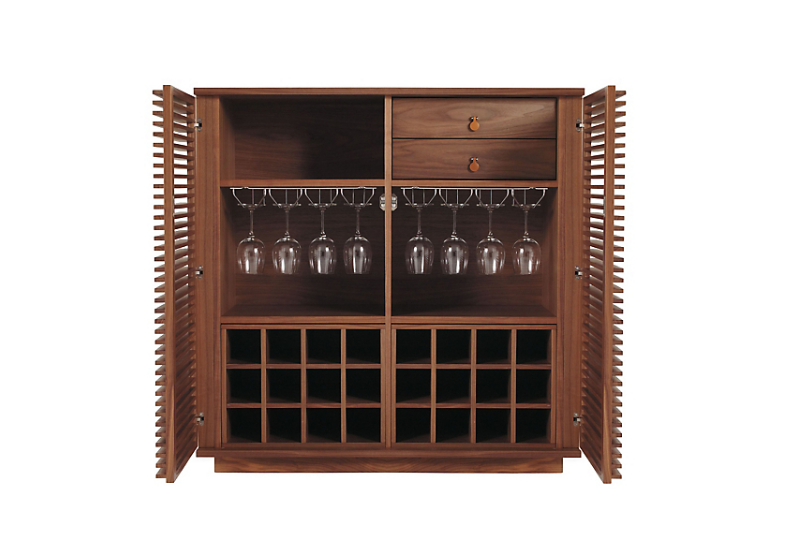 The Line Wine Bar (2010) has two drawers with leather pulls, one open cubby, two storage racks for stemware and two storage racks for a total of 24 bottles, twice the storage as the Line Bar.